Stem cells are one of the most fascinating fields in modern biology. They have important properties and serve as our body’s repair kits. Renewal and repair are ongoing processes in the human body. Adult stem cells supply the necessary cells for this replacement. They have been identified in over 20 organs or tissues. Two key features set them apart from ordinary cells: They can differentiate into a diverse range of specialized cells of the same tissue and they have the remarkable ability to renew and regenerate themselves through cell division throughout a person’s life. This makes stem cells especially valuable and important in regenerative skin care research. Adult stem cells are also present in the outer layer of human skin, the epidermis. These cells are called epidermal stem cells and are found in the innermost layer of the epidermis (basal layer). Every second to seventh cell in this layer is a stem cell. Although their appearance does not differ from that of the other cells in the basal layer, stem cells have a unique function: They constantly renew and rejuvenate the epidermis by forming new keratinocytes and regenerate damaged tissue as only these cells have the ability to divide indefinitely (see figure). In young skin, the epidermis fully renews itself approximately every 4 weeks. This process continuously slows as we age. The number of skin stem cells decreases and their vitality diminishes. Excessive UV exposure of the skin and an unhealthy lifestyle (smoking, alcohol) aggravate these effects considerably, resulting in thinner, more deeply wrinkled skin. The hydrolipid film is reduced, which leaves the skin dryer and less well protected. As no new epidermal stem cells can develop during a person’s life, it is all the more important to maintain the vitality of these valuable cells and their ability to divide as long as possible. Plant stem cells protect skin stem cells. How does this work? Every stem cell contains specific epigenetic factors whose task is to preserve the stem cells’ multi-potency and its ability to self-renew. Mibelle Biochemistry researchers have discovered that plant stem cells contain epigenetic factors similar to those of adult human stem cells. Applied in the right way, they have a positive impact on the vitality of skin stem cells and their proper functioning. How can the vitality of epidermal stem cells be measured? Is it even possible to improve the vitality of stem cells, keeping the skin youthful longer? Proving this is particularly difficult since epidermal stem cells look exactly the same as the other cells in the basal layer. Only the development of a new test method, the so-called “progenitor cell targeting”, made it possible to isolate stem cells from the human epidermis for test purposes. These epidermal stem cells can be grown in Petri dishes using specific culture media. Using this cell culture test, one of the unique properties of stem cells, the colony-forming efficiency (CFE), can be assessed in the lab. First, very dilute dispersions of epidermal stem cells are plated on Petri dishes. Each vital, healthy stem cell divides , forming a colony of cells, which is visible to the naked eye and can then be counted. Stem cells that have aged and are weakened do not die, but they no longer form such colonies. Researchers were thus able to show that using plant stem cells (all PhytoCellTec™ products) is proven to increase the longevity and colony-forming efficiency – essentially, the vitality – of epidermal stem cells. Water is a potent source of skin food to nourish cells and hydrate skin for a smooth complexion. Our innovative Triple StemCell H2O Moisturizer increases your skin stem cell vitality and regeneration. This moisturizing gel acts like a water network providing instant freshness while liberating its stem cell ingredients keeping your skin radiant and youthful. Triple Stemcell H2O Moisturizer hydrates your skin releasing stem cells into your skin. It soothes, hydrates, restores and nourishes your skin cells so that it remains fresh and supple throughout the day. Moisturizing your skin all day long! The sun’s radiation causes our skin to dry. Triple Stemcell H2O Moisturizer naturally protects your skin against UV radiation and works as a defense against dehydration. Protecting your skin against further damages while leaving your skin healthy. Free radicals damages your skin and causes ageing. Triple Stemcell H2O Moisturizer releases stem cells into the skin that promotes regeneration and repairs damaged skin. Bringing out your skin’s radiance after each use. Phytoscience products are made from Stem Cells. Stem Cell is the new face of science and it’s the medicine for the future and the future starts now. So many health threatening diseases have been put under control by using this stem cell technology. Before we talk about these amazing products, let us talk about what stem cells are in the human body. Cells are the basic structural and functional and biological unit of every living thing. One of the main characteristics of stem cells is their ability to self-renew or multiply while maintaining the potential to develop into other types of cells…. Stem cells can become cells of the blood, heart, bones, skin, muscles, brain etc. By increasing the number of your stem cells, you can nourish and rejuvenate your heart, blood vessels, arms, kidneys, joints, skin and internal organs. Stem cells are special, very valuable cells that are present in small numbers in almost every tissue, including the skin. Only stem cells can divide over the course of a person’s life and create new skin cells, continuously renewing the epidermis. As we age, the vitality and number of skin stem cells decreases, the epidermis takes longer to renew itself and wrinkles form. PhytoCellTec™ Malus Domestica (Apple Stem Cells) & PhytoCellTec™ Solar Vitis (Grape Stem Cells), and enriched with phytonutrient-rich superstars – Euterpe Oleracea (Acai Berry) and Vaccinium Myrtilus (Blueberry) which is exclusively formulated by Mibelle BioChemistry lab in Switzerland. This Swiss quality formulation efficacy is clinically proven and 100% natural. Double Stem Cell fondly called “Life in an envelope” is an amazing product which has been widely said to help men and women from all ages and backgrounds to achieve maximum health and beauty in minimum time. With so many success stories so far, the demands are unbelievable. Who says you can’t remain youthful? Double Stem Cells rejuvenates your face, body and organs by protecting cellular longevity. The apple stem cell delays the ageing process naturally leaving your body feeling fresh and revitalized. Shielding your youthfulness at the cellular level! UV Radiation is responsible for 80% of skin ageing. Solar Vitis stem cells contains polyphenols known for UV protection. It differs from sunblocks and filters as it protects your skin on the cellular level and restores the skin’s regenerative capacity. Protecting you all day long! What is PhytoScience Double Stem Cell? cell), and is further enriched with nutrient-rich Acai berry and blueberry. It nourishes your skin from the inner level to give you a significant and effective result. 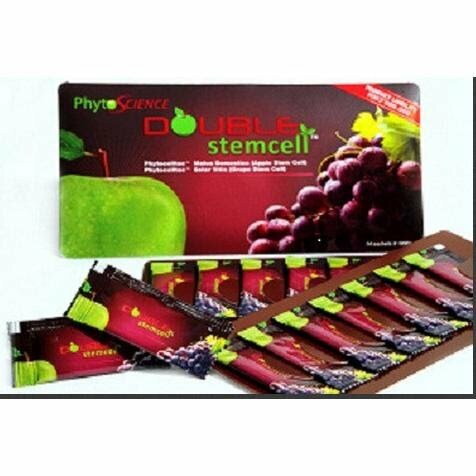 DOUBLE stemcell also rejuvenates and activates body cells to raise energy and improve vitality. It is a safe, natural and convenient product for both women and men. Mibelle Biochemistry research team, and later the scientists of Mibelle Biochemistry have successfully developed the stem cell of Uttwiler Spatlauber Swiss apple. United State, Michelle Obama, Helen Mirren and Jennifer Lopez. as due to UV radiation. It extends cellular vitality to keep your skin young and always radiant. vitamin A, B1 and E.
mind power as well as improves flu, cold, sore throat and diarrhea. Can Double Stemcell™ be used on Children? supervision. This product is safe and Non-Toxic. Is it safe to consume Double Stemcell™? Ministry Malaysia(KKM) and it has went through Standards and Industrial Research Institute of Malaysia (SIRIM) and SGS Singapore General Laboratory Testing Standard. This product is confirmed safe and 100% plant base. The product is effective but a lot of consumers wish to take consistently and FOC? earn for free redeem and get some extra income. Can Double Stemcell™ healing any of chronic illness as what the consumer had claim in their testimonial? body, when after the body immunity system improved slowly the illness will get healing. What dosage should I take to obtain the best results? required. Double stemcell™ should always be taken before breakfast and before bed at night. Does Double stemcell™ have any side effects? week or more to notice the effect. Can Double stemcell™ be taken by aged and diseased people? both men and women is always within physiological normal limits and thus it is increasingly being seen as a safe and natural performance supplement for sportspeople. therefore completely legal in competition. Can Double stemcell™ be taken by diabetes patient? normal. They said this may cause of the possibility the antioxidants of the product. Which is the best method of consume Double stemcell™ for more effectiveness? lot of nerves that can easily absorb due to the molecules is small. What is the difference between embryonic stem cells and adult? pluripotent cells derived from the inner cell mass of an early stage embryo. They have the potential to develop into any type of cell in the body. Adult stem cells are responsible for supplying cells need replacement in adults. They have been identified in more than 20 organs and tissues. Compared to embryonic stem cells, adult stem cells can generate cells of the organ in which it is found. Therefore, they are referred to as multipotent. What is the characteristic of Double Stemcell that makes it so unique? the human body. It repairs, and prolong the life of the human stemcell, which helps the body to repair naturally. How is the effect of stem cells tested and what tests are conducted? activities. The positive effects have also been confirmed in tests on test subjects. Our blood carries an important function of transporting oxygen and nutrients throughout our entire body. How do we ensure the longevity of our blood? The answer is Snowphyll™Forte which consists of Snow Algae Chlorophyll & Mulberry Leaf Extract formulated by Mibelle BioChemistry Switzerland to help repair, rebuild and replenish our blood. Some studies have shown that wheatgrass acts as an antioxidant because of it contains vitamins A, C, and E. Antioxidants reverse the effects of free radicals. These volatile compounds in the body have links to aging and other health issues, including cancer. Antioxidants help fight chronic inflammation, which occurs when the immune system reacts to particular health issues, such as arthritis, stomach problems, skin issues. Antioxidants might even help with mental health concerns, such as depression. Oral bacteria that resides in a person’s mouth causes bad breath. Snowphyll™Forte acts as a deodorizer that eliminates bad odor & reduces stringent smell of urine, infected wounds and feces. No more stink but smelling fresh throughout the day.